As a precaution, Turkey's culture ministry has suspended all restoration work at the site, which houses mosaics dating from the 2nd Century to the 6th Century AD, the website says. In December, the museum opened a huge new building, and curators are currently in the process of moving artefacts into the space. When the move is complete, it will devote 5,000 sq m (54,000 sq ft) to displaying mosaics. 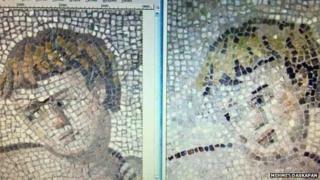 Turkish media have likened the episode to an elderly Spanish woman's attempt to restore a Jesus Christ fresco in 2012. The finished product, on the wall of a church near Zaragoza, looked nothing like the original image.